A few days ago, a Young Winos member posted a Slate article on the LA chapter’s new Facebook group (which any LA-based Wino who wishes I would e-mail him or her more often would be well-advised to join). The article, entitled “Drink Cheap Wine,” purports to illuminate the numerous reasons why drinking inexpensive wine is as good as, or perhaps even preferable to, shelling out serious green for serious white and/or red. While the Young Winos have always been ardent proponents of seeking out bargain bottles, we’re more than a little skeptical of the logic by which the author arrives at his ostensibly sensible thesis, and we’d advise our readers to calm their nerves with a humongous glass of something alcoholic before diving into this one. The more insidious claim, though, is an implicit one that has more to do with wine consumers than with the wine itself. “Professional wine critics are quick to point out that they, unlike you and I … have gotten very good at sniffing out the traits that the wine industry thinks entitle them to more money,” Palmer writes, and then lists “cassis, subtle earthiness, and jammy notes,” as examples of these highfalutin’ traits, which he assumes “don’t interest you.” Wait a second — why would he possibly think those don’t interest us? Were we not reading an article about wine in a publication known for excellent wine writing? Does Palmer really think that an interest in exploring the nuances of wine is one entirely foreign to the readership of Slate, which, by my approximation, generally consists of well-read, intelligent, young to young-ish people? We’re not a great unwashed mass of indifferent hedonists, Brian. We like a little thinkin’ with our drinkin’. Palmer’s implication that the average person has no interest in drinking wine contextually and analytically betrays the degree to which he’s out of touch with the way in which wine is increasingly being consumed these days. He sings the praises of “consistency,” a trait that’s anathema to anyone for whom wine is a process of discovery and surprise; consistency is fine in breakfast cereal and light beer, but wine should never find itself so regimented and commodified. And he lionizes the “modern technology” that allows American producers to “crank out consistent wines, case after case” — when, in fact, more and more consumers, young people in particular, are rejecting wines that taste like technological triumphs (i.e. liquid-oak and grape juice concentrate), as so many of the cheap ones transparently do, and indeed are wary of any wine that can be “cranked out.” “Wine is not art,” Palmer writes, in effect cementing his anti-snob soapbox to the corner of Smug St. and Populist Ave. That’s the kind of clueless, pejorative sentiment that anyone who appreciates wine for more than its intoxicating qualities could never get behind. As I said earlier, the Young Winos love our cheap wines. When we find one that speaks to us, we buy it by the case, pour it for friends, and brag about what a steal it was. 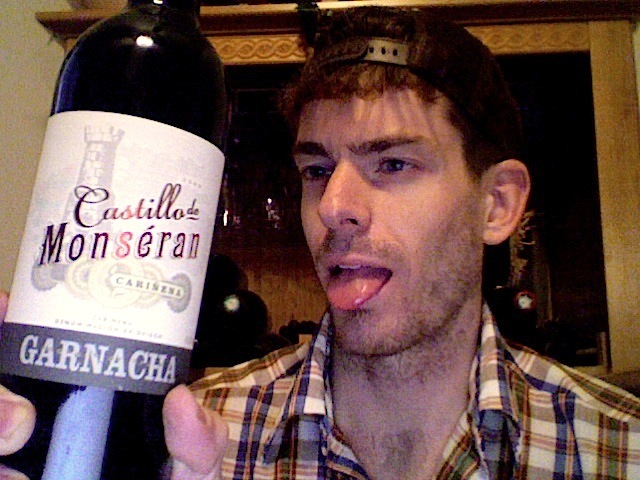 Earlier today, a bottle at K&L in Hollywood caught my eye, the 2009 Castillo de Monseran Garnacha from Cariñena in Spain. Having never tried a bottle from Cariñena, I resolved to open it tonight, and I made good on my resolve. The nose smelled of leather sofa, prunes, and grape jelly; while the jelly dominated, a little ground pepper made an appearance, as did a bit of strawberry fruit leather. On the palate, the Garnacha proved light and fruity, with a playful spice profile and cherry flavors in abundance. The wine was not tannic, and might’ve even been well served by a slight chill prior to pouring. Happily, the wine discovered its body as it sat in the glass, and it exhibited a nice bit of plumpness after an hour or so. At $7.00, I’d call the Monseran a crowd-pleasing quaffer that I’d likely revisit. The thoughtful, unhurried way in which I approached the bottle and considered its attributes along with its limitations is more familiar to today’s young wine drinker than Brian Palmer seems willing to believe. There’s nothing wrong with hedonistic wine-drinking, of course, but my belief is that drinking a wine studiously and analytically actually enhances pleasure, rather than interfering with it. We echo Palmer’s cry to “drink cheap wine,” but we implore you to do it the right way, the satisfying way, with a solid portion of context and critique as a chaser. Of course, as true Winos, you already knew that. Now stop reading and go refill that humongous glass. All that way…and then you lost us at “quaffer”.